Humidity 94.0% · Barometer 30.21"
About RadarWatcher is a concept I came up with ages ago and have been using locally on my own computer for years. 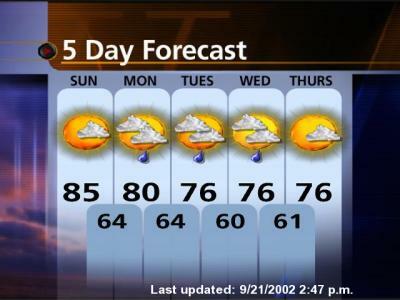 Over time it has taken many forms and has had a few makeovers, but its goal has always been the same: provide a weather synposis at a glance for a local area. 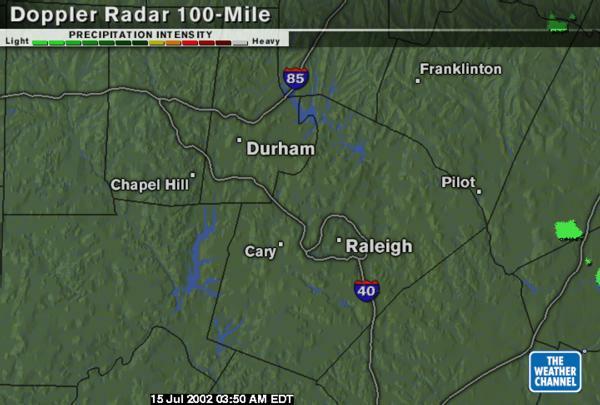 WRAL.com Doppler5000 products including animated and zoomable static views of Central North Carolina and Wake County. 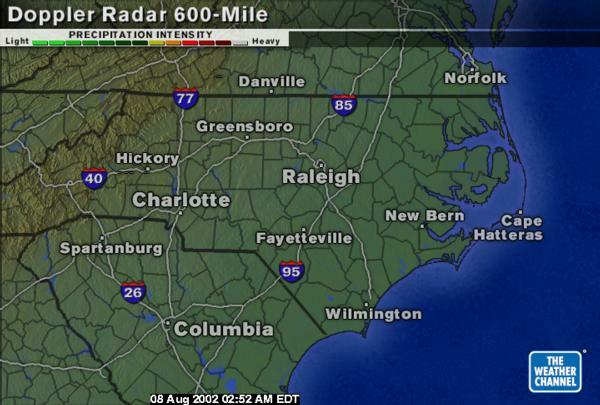 The Weather Channel products including zoomable views of North Carolina and The Triangle. METAR weather data from NWS station KRDU. In the past I have included other maps as well but the more you include the more cluttered the display gets and the larger the computer monitor you need. How To Use RadarWatcher couldn't be simpler to use, simply load the page and watch it. The page will automatically reload every 10 minutes and refresh any available data. The radar maps usually update every 3-10 minutes however there are times when stations may take the computing power away from these maps and apply them to more important tasks such as storm tracking. The METAR data usually updates every hour. Heat Index is shown for temperatures >= 70 degrees when the value is > the air temperature. Wind chill is shown for temperatures <= 50 degrees when the wind is >= 3 mph and when the value is < the air temperature. Note that METAR data may take time to load, if the page takes 30 seconds, just let it be, eventually it will display, most likely stating "No data available". Copyrights RadarWatcher contains data from numerous third-party sources which may be copyright by their holders. This site also makes use of phpWeather which is copyright (c) 2000-2002 Martin Geisler to decode METAR data. RadarWatcher is copyright (c) 1995-2002 by Joe Zobkiw. Disclaimer RadarWatcher uses several third party sources to display weather information. You should not depend on RadarWatcher as your sole source of weather information as it may be inaccurate. Reload this page for the latest updates.